On March 15, students across the globe marched and rallied in support of the Global Climate Strike in more than 123 countries in what is being reported as one of the largest demonstrations in history. These events made headlines around the world as hundreds of thousands of students raised their voices, gave powerful speeches and held handmade signs with strong messages about climate change. 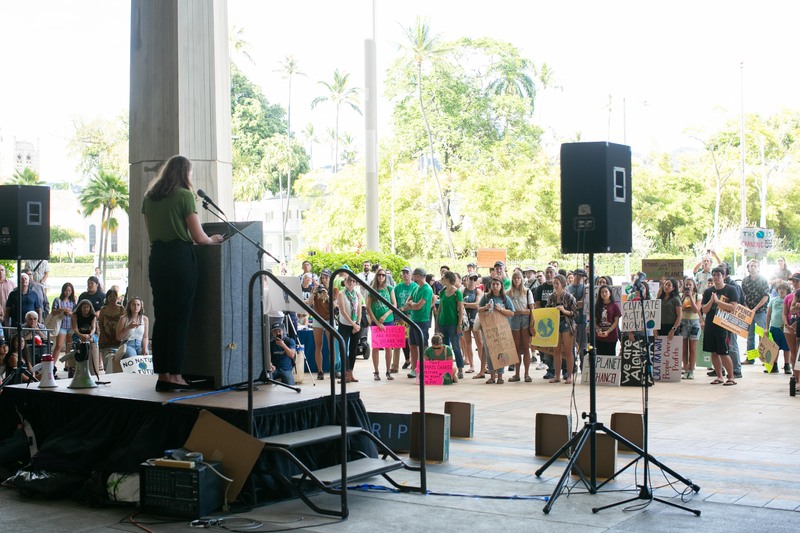 Here at home, the Aloha State closed out the day's demonstrations at the Hawai'i State Capitol, where hundreds of individuals from schools, nonprofit organizations and the community joined together to stand up against climate change inaction. The Priory senior Olivia Stoetzer is currently interning at the Sierra Club's Hawaii Chapter and was inspired to get her classmates involved in this important day in history. As part of the St. Andrew's Global Leadership Initiative, she mobilized ten of her classmates to participate in the rally. Speakers at the Hawaii rally included Stoetzer and freshman Jemma Stollberg; Charles "Chip" Fletcher, who is a climate scientist and professor and associate dean for academic affairs at the University of Hawaii; Hawaii State Representatives Cynthia Thielen, Nicole Lowen, and Tina Wildberger; Hawaii State Senator Russell Ruderman; and 11-year-old climate activist Mesina DiGrazia-Roberts. "We all know that change needs to come from the very highest level," Stollberg said at the rally. "But in the meantime, a lot of people want to know what they can do to help out. A lot of tips are given – see if you can get solar panels, turn off lights and take shorter showers. Here's a tip to protect native species you may not have heard. If you want to buy a real Christmas tree, buy one grown in Hawaii. Importing Christmas trees often brings over other invasive species like yellowjackets." Stollberg's talk was mainly focused on the effects climate change is having on Hawaii's wildlife population, namely native birds species, of which 16 are already extinct. Stollberg received roaring applause and cheers from the crowd and at the end of her speech was approached by a state representative who commended her on her public speaking skills. When Stoetzer took the stage later in the program, she focused her talk on the how the time to act on climate action is now and how everyone shares in that responsibility. Her speech also received enthusiastic cheers, applause and praise. "We have 12 years to avert a climate change catastrophe," she said. "The legislation that is passed by today's legislators will have the largest impact on my generation and generations to come. I am 17 years old; I cannot vote. However, I have a civic responsibility as a citizen of this nation and an inhabitant of this planet to speak up in solving the problems of tomorrow. The earth is getting hotter and our oceans are rising. Every day we must make decisions to bolster our climate. We as consumers and the public need to change." Stoetzer was also a guest on the Hawaii News Now Sunrise show on the morning of the demonstration. She was invited, along with DiGrazia-Roberts, to speak about the importance of Friday's event and why students should get involved. The current movement is what has developed since 16-year-old activist Greta Thunberg protested for climate change action solo on the steps of the Swedish Parliament last year. That grew into #FridaysForFuture movement and then into Friday's demonstration. Thunberg is now being nominated for a Nobel Peace Prize. "Climate change is such a large part of our curriculum [at St. Andrew's Schools] and everyone believes it is real," Stoetzer said. "But there's nothing been done to address it and if nothing is being done, we need to demand that something is done." See more photos from the event in our March photo gallery.